This course is an exciting addition to our course curriculum and will be invaluable to those therapists who wish to add a major technique of ‘energy therapy’ to their existing practice/business. It is also suitable for those who wish to begin a new career in this field. Our course is intended to take the student from beginner to knowledgeable practitioner. The student will be introduced to the concepts of subtle energies and energy healing and to the interpretation and therapeutic application of the concepts of the energy field, frequency, and resonance. 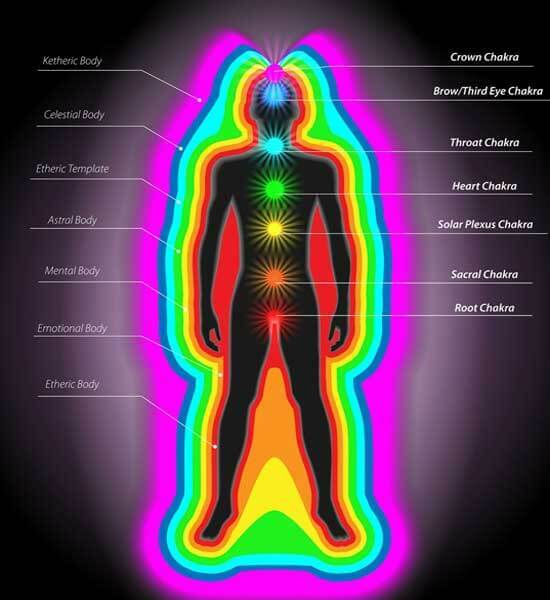 The student will learn in detail about the body’s surrounding energy field, known as the aura, and the body’s energy vortices, known as the chakras. This detailed knowledge is the bedrock which will enable the student to become a qualified practitioner and thus apply the knowledge effectively to restore equilibrium and health. • Energy Healing – what is this? • Linkage between the 7 major chakras and the endocrine system, adrenal glands, overies and testes, pancreas, thymus, thyroid, pituitary gland, hypothalamus and pineal. • 7 Major Aura colours – Red, Orange, Yellow, Green, Blue, Indigo and Violoet. Plus Gold, White/Silver, Pink, Brown and Black. The student may wish to acquire a pendulum and also some divining rods – these can of course be made. I made my rods (as shown in the course) from a wire coat hanger and a piece of bamboo cane. Colour cloth swatches can be made from suitable scraps from around the house or purchased from suppliers. Light and colour filter boxes may need to be purchased. Aura cameras are introduced but unless the student wants to go into business as an aura photographer at therapy fairs, they would not need one – they are very expensive systems. The sound of singing bowls and tuning forks can be found on CDs. Basically, minimal expenditure is needed. A Case Study write-up will be required prior to requesting the final paper and after all lessons have been successfully completed. After retiring from a successful career as a Consulting Naval Architect and Structural Engineer, Tony Edwards devoted his energies to the study and practice of complementary therapies. He holds professional qualifications in a wide range of therapies including Naturopathy, Nutrition, Psychotherapy, and Clinical Hypnotherapy. Tony is the author of, and also tutors, several of our internationally respected School of Natural Health Sciences distance learning courses. These professional courses cover a range of well-established complementary therapy subjects such as Hypnotherapy and Psychotherapy, Meridian Psychotherapy, Crystal Healing, Diabetes Risk Awareness, Nutrition and Herbalism. I just thought that I would drop you an email to let your School of Natural Health Sciences know how very much I am enjoying your very interesting, intriguing & challenging courses. The coursework is MARVELLOUS & VERY WELL COMPOSED. It maintains the student’s concentration from start to finish of each assignment. I just hope that I can match the School’s impeccable presentation with my coursework answers.